Billed a reluctant messiah and man of the people, with an O-level in woodwork, Otiz Cannelloni is probably best summed up as a mix of a crazy children’s entertainer meeting an even madder messed-up magician, Otiz’s act defies description and beggars belief – and audiences can’t get enough of it. And neither can his peers. 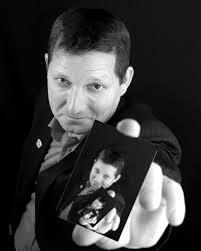 Otiz is loved and revered in the business as “a comics’ comic”, and wherever he performs, his usually cynical fellow comedians can be caught at the rear of the room, spellbound by his lunacy and laughing manically and with a jealous if appreciative glint in their eye. Like Tommy Cooper before him, Otiz combines the illusion of magic and the reality of stand up to produce a hybrid variety that shifts effortlessly between the three pillars of sheer genius, outright lunacy and utter stupidity. Just as you begin to suspect Otiz doesn’t have a clue what he is doing on stage, he proves it for you beyond all doubt. But then it has taken him years of practice to make something so utterly straight-forward look quite so difficult.